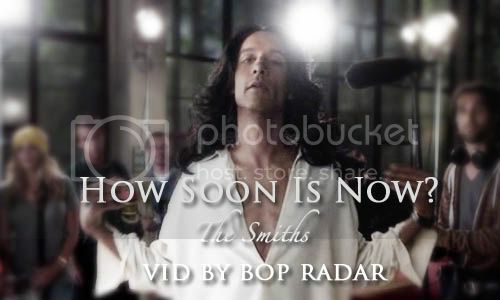 Vid: How Soon Is Now? This entry was originally posted at http://bop-radar.dreamwidth.org/228175.html. comments Comment here or there, as you will. I haven't seen any of the episodes referenced, but this is very cool. And I even recognised the music! Although that's because of the tv show Charmed, rather than anything to do with the band. I'm not going to wonder just how long Abed has been toying with becoming a romance-era poet. I can just picutre him and Byron terrorising the Italian countryside. Haha, that was perfect. And surprisingly touching there at the end. Well done! Shirley and Abed! Coming together in friendship! oh show ! Glad you like the vid! I don't even believe in God, but I love me some Abed (and kuwdora and boppy). I'd use more exclamation points but I don't want to embarrass myself. Abed looks so good with longhair, yesssss. We loves it, yes! Glad you like the vid! Abed is amazing! eeee! someone protect this vid from Shirley! omg you are in for a treat!! season 2 omg! Abed gets to be amazing time and time again! Shirley and Abed! Christian and Muslim! There can be peace! <3 ! OMG! The end of that actually made me TEAR UP! I rarely like serious vid treatments of Community, but you knocked it out of the park with this one. Seriously! This show gives awesome character development!! And the only way you can take meta!Abed-Jesus IS seriously ! Thanks! Glad you liked! Abed and Shirley are AMAZING! I've never seen this show, though I have heard about it. It certainly looks interesting! I ended up watching the Capital G video as well and thoroughly enjoyed that heh. Yay Eric and Godric. Oh! I didn't reply. *headslap* Thanks! :D Abed is indeed the second coming. so i finally got around to watch this - and homg, it's awesome! that episode was so so good & this vid is right there between the cracky fun & emotionally touching ... i love it. Ohh, sorry for long-delayed reply! So glad you enjoyed it. :) It's amazing how many episodes of Community contain potential for episode-specific vids, I think! The premises they come with are so cute and cracky! I only just started to watch Community. First episode I watched because of Farscape mention, next because half of the fandom was squeeing about the Dungeons and Dragons one and it was beyond awesome (and I've never even played D&D). I decided to keep watching from the beginning and it's amazing. I really like this vid. I'm always so impressed by people making episodic vids, putting only so much material as 20 (or even 40) minutes into one vid. Great work! aw, this was lovely! OH ABED. Shirley holding Abed's hand at the end just melted my heart; I love the love they have for each other at the end of that episode. Beautiful work. That episode was one of the most brilliant things I've ever seen on television and your vid is perfect. Perfect. Thank you! I had forgotten about this vid and enjoyed rewatching it myself, hee! ;) So thanks for reviving it for me with your comment. :) The genius of the idea was all kuwdora's!